What, to the American slave, is your 4th of July? I answer; a day that reveals to him, more than all other days in the year, the gross injustice and cruelty to which he is the constant victim. To him, your celebration is a sham; your boasted liberty, an unholy license; your national greatness, swelling vanity; your sounds of rejoicing are empty and heartless; your denunciation of tyrants, brass fronted impudence; your shouts of liberty and equality, hollow mockery; your prayers and hymns, your sermons and thanksgivings, with all your religious parade and solemnity, are, to Him, mere bombast, fraud, deception, impiety, and hypocrisy — a thin veil to cover up crimes which would disgrace a nation of savages. There is not a nation on the earth guilty of practices more shocking and bloody than are the people of the United States, at this very hour. Where Did I Leave That Fire? Will a stranger find it on a curb idling? Cold cough and the time zone just short of outer space? Lyrics to Where Did I Leave That Fire? by Neko Case. but I didn’t find starlight to indicate the path. I doze off with a dream petting my eyeball. At the same time I fear the daybreak will bury me. Don’t ask who I am. Ammar Tabbab, via the Atlantic and the General Assembly. Next winter when the cold blasts are creeping through the rents in your seedy garments, when the frost is biting your feet through the holes in your worn-out shoes, and when all wretchedness seems to have centered in and upon you, when misery has marked you for her own and life has become a burden and existence a mockery, when you have walked the streets by day and slept upon hard boards by night, and at last determine by your own hand to take your life, - for you would rather go out into utter nothingness than to longer endure an existence which has become such a burden - so, perchance, you determine to dash yourself into the cold embrace of the lake rather than longer suffer thus. But halt, before you commit this last tragic act in the drama of your simple existence. Stop! Is there nothing you can do to insure those whom you are about to orphan, against a like fate? The waves will only dash over you in mockery of your rash act; but stroll you down the avenues of the rich and look through the magnificent plate windows into their voluptuous homes, and here you will discover the very identical robbers who have despoiled you and yours. Then let your tragedy be enacted here! Awaken them from their wanton sport at your expense! Send forth your petition and let them read it by the red glare of destruction. Thus when you cast "one long lingering look behind" you can be assured that you have spoken to these robbers in the only language which they have ever been able to understand, for they have never yet deigned to notice any petition from their slaves that they were not compelled to read by the red glare bursting from the cannon's mouths, or that was not handed to them upon the point of the sword. You need no organization when you make up your mind to present this kind of petition. In fact, an organization would be a detriment to you; but each of you hungry tramps who read these lines, avail yourselves of those little methods of warfare which Science has placed in the hands of the poor man, and you will become a power in this or any other land. As soon as riches came to be held in honour, and brought glory, imperium, and power, virtue began to grow dull; poverty was seen as disgraceful, innocence as malevolence. Therefore because of wealth, our youths were seized by luxury, greed and pride; they stole and squandered; reckoning their own property of little worth, they coveted other peoples'; contemptuous of modesty and chastity, of everything divine or human, they were without thought or restraint. From The War With Catiline by Sallust. Arrival, based on Ted Chiang's excellent The Story of Your Life, is an amazing film; I've seen it three times, devoured the original fiction in a single session, and spent a few enjoyable hours dissecting it and everything in between with the delightful and talented Tara Cartland. We thought having a record of these discussions would be nice, and help us understanding our strong yet differing emotional reactions to both film and written story. What follows is an email exchange and massive, unthinkably unfair spoilers. If you have any interest in seeing it, go now. We'll wait. I think this goes to the heart of our questions around adaptations; What to keep? What to remove? How does the new medium change the narrative? With this story/film in particular, the changes are necessary and, for me, mostly welcome. The short answer to the question is: because it's no longer the story of someone else's life. The shift from a first person narrative to third person, necessitated by the shift in medium — and the nearly inherent distance filmic conventions — mean the subject of the film is no longer "Hannah" (left nameless in the short story), but Dr. Banks. This shift in focus changes the weighting of narrative structure, too; far more time is spent with Dr. Banks and her translation work in the film, and less on the life of Hannah. I think one advantage the written story has is the ability to shift tenses and timeframes rapidly. By projecting forward and backward in the same moment, it enables us to inhabit many spaces contiguously. Film, more so than almost any other medium, is reliant on putting one foot in front of the other. It's quite common for films to take us into a character's past or future, but it usually requires a grounding in the present. Notable exceptions to the are Shane Currath's Primer (to a lesser extent, Currath's Upstream Colour does the same) and Christopher Nolan's Memento. We've spoken about this having a chiastic structure, which is something much more common in literary convention than filmic, but I do think both Arrival and Story of Your Life are phenomenally successful variants of the same ring. Even if they have different names. And in doing so acknowledges the limitations of Louise’s subjectivity. This is powerful - even when she can see into the future, it doesn’t make her more perceptive. If anything, she’s more human, thankful and joyous that she can care so deeply about something she can’t understand. In the film, Hannah exists essentially and only in relation to Louise (and later, somewhat in relation to Ian. Although that, too, is ultimately about Louise). And so the film is somewhat more solipsistic in its telling. While it retains anti-solipsism as a theme, it maybe loses something here - another concentric ring, perhaps - and I ended up missing the thoughtful tone of the story. Both texts prompt you to experience them as Louise. But the ‘knowing Louise’ of the story and the ‘learning Louise’ of the film offer very different experiences. Emotional engagement with both is achieved, I think, differently too. This gets at something I’m itching to talk about I’m going to completely ignore your question and instead ask you another one - does the Louise of the film have free will? You're exactly on the money with the variation between Knowing and Learning of Louise—I think these are necessarily different experiences due to the way each medium gets us to engage with the characters and their story. Film necessarily requires us to Learn the character, as we cannot see, know, or understand their inner thoughts without monologue (a trope to be avoided). Instead, we must learn who they are through the way they respond to the scenarios presented to them. I think it's telling that Filmic Louise—actually, maybe in the parlance of Story of Your Life, Louise B is better. So, it's telling that Louise A (story Louise) and Louise B (film Louise) react in the same way to the appearance of Colonel Halper, and yet the way these reactions play out is entirely different. We see Louise A's ambition and excitement through her inner monologue, the way she describes and reacts to the information presented. We see Louise B's ambition and excitement through her eventual push and competitiveness for the opportunity; something which unfolds over time. These moments position the Louises as people who have wants, needs, desires which extend beyond the map of the story—there is an academic life for Louise only barely hinted at within these moments. And yet, they are part of the weaving of personality through the film which creates the emotional punch at the flip towards the end (or the very end) of both stories. The written story naturally calls for reflection and thoughtfulness; it enables us to engage with the subject matter at an intellectual level which is not allowed for in the film. Chiang is able to spend multiple paragraphs describing the ins-and-outs of the heptapod language structure, whereas I think doing so within the film would probably lose some audience engagement. (I did very much enjoy the breakdown of how to frame a question and the assumptions within it as shown in the film. Nerd alert.) However, the multi-sensory approach film allows for delivered, for me, a bigger emotional reaction to the narrative. I'll ignore you ignoring my question... So, does the Louise of the film have free will? This probably goes broader than you're wanting, but it does raise the question of any of us having agency over our choices. Sam Harris talks in his book Free Will about the appearance of choice not being the same as actually having choice. There's an interesting paragraph which I don't have in front of me now, but, to paraphrase, it states that; examining the point at which choices come from reveals a nothingness. From where does the choice spring? Do you have control over thinking or not thinking? These answers would imply that none of us have Bonafide Free Will™, but more of a Free Will Light™. And then we have Daniel Dennett's compatibilist counterpoints to respond to... maybe best to leave that discussion for another time. To project onto the final moments of the film, I would suggest that Louise B has made a Choice. Interestingly, we don't know, in the way that we know in the book, whether this is a real Choice or the Vision of a Choice. The montage of moments leading to the final shot of [SPOILER HORN] Ian's embrace would suggest that she does have free will, she has accepted her choice, and will live out her life as shown within the memories of Louise B. How reliable is the film as a narrator? We seem to be taking it as wrote that these memories are real and true memories—the film does not suggest otherwise, of course. It's implied that Louise A has choice, but that choice appears to be deeply influenced by the modification of her thinking. It becomes more instinct than cognition. I think. Don't you find it interesting that pre-knowledge of events for the Louises reinforces their humanity, their emotion, in a way that pre-knowledge of events did not for your impression of the film? I mean, hearing that "Who is that child?" line for the first time was a shock, but compared to the repeated gut punches dotted throughout on second viewing... hoo boy. I'm curious about your impression of the Drs. Banks agency... who has more agency? Louise A or Louise B? Well - to address your second last paragraph -l, to address your point about carrying in pre-knowledge (from the story) to the film - that was exactly my I certainly experiencehad an even more emotional reaction when I read the story for the second time. And I suspect this will be my experience when I see the film again, I’m surein (and I’m not caught up trying to figure out how it works). That’s why we’re talking about this as a successful adaptation. The emotional truth of Chiang’s work is so beautifully intact. But I wondered, halfway through the film, if I was going to cry. (Reading and rereading the story makes me cry.) I was loving the film, but I wasn’t getting as emotionally involved. And I realised it’s because I was too caught up in trying to figure out how it worked. Towards the end of the film, when I no longer had to figure that out, the full and cumulative force of it hit me and I did gross, snotty crying. Who has more agency? It seems to me that Louise B has more agency, and some sort of free will to boot. Louise A has given up her free will - although as you point out, it’s written in a way that softens and minimises that fact (presenting her non-choice as a willing choice, an instinct followed or a line recited). Louise B, I think, has not. Let’s consider both sets of ‘memories’ of the future. Louise A knows everything there is to know about who she is, and why she got there. There’s no context missing - in that memory, she also has the memories of everything leading up to that moment, and acts accordingly. Louise B does not - she doesn’t seem to know completely what is happening or why, even though she goes with the flow. Crucially, she brings information from these future memories (such as the General’s phone number) into her present thereby arriving (so to speak) at the time travel paradox the story so neatly avoids. This is why Hannah’s death is changed (translated even?) from a rock climbing accident to a congenital and fatal disease; something no one - even with knowledge of the future - could have prevented. For me, it’s less poignant than the accident in the story. I can relate to the helplessness of a narrator watching someone they love taken by disease. But I am confronted by a narrator who can do nothing to stop a simple accident - seemingly so preventable - from taking place. And for me that depth of feeling is the real gift of the story. I feel a need to raise issue with one of your points—the idea that no-one could have prevented Hannah’s suffering. I think the emotional weight of the film rests on this question (in fact the third last line of the film): Should Louise B have made the choice that she did about her future, knowing everything that would come to pass? Once again with this retelling, I think what we’re seeing is not a removal of the emotional/narrative intent, but a restructuring of it to make sense for the medium in which it is presented. The climax of the film dramatically is Louise B’s “mad dash for translation” and the conversation with her antagonist (how nice that a film with aliens in it rests on a conversation! ), but emotionally it is those last few future/present moments with Ian. Your question is reminiscent of one of the challenges presented and left unanswered by both Chiang's original story and, to a slightly lesser extent, the adaptation; what are the geopolitical impacts of discovering alien technology ahead of other nations? This is something Paul Macauley tackles within his work, and I think for the sake of the story, it is lucky that this technology—their language—is given to someone whose intention for the use of it lacks malevolent intent. The same challenges are raised with the development of ‘true’ artificial intelligence; if one nation were to develop that technology ahead of another, how would that technology advantage or disadvantage global outcomes? How do other nations react? How does the ‘host’ nation use it’s newfound power? These are challenging questions that we actually have no answer to, and neither does Arrival/Story of Your Life. What is interesting for me is that within the film, it appears that the Heptapods have been able to advance their understanding of their language to such a point that they effectively become omniscient; they can see beyond the end of the cigarette ash, unlike Louise A and Louise B (although it is not clear that Louise B is fully unaware of the future). So… why gift the language? This is getting beyond the text, there is reference within the original story to the Heptapods encountering plentitudes of other, non-sentient lifeforms—maybe this is about recognising sentience? Part of me feels that the strength of the narrative rests on the enigmatic nature of the encounter; the fact that their motives are unknowable is, again, a central plot point to Arrival. Unlike the heptapods, we cannot know all. Okay; last question for you! Would you make the same choice as Louise? The short version is: yes. The longer version is: if I was Louise, yes. Longer again - I'm struggling to say that I would choose to have a child, no matter the grief it would result in, because the experience of love would make it worthwhile. And the more I hold that concept in my mind, the more it feels like an anti-choice ("pro-life") sentiment. Here is the thing: Louise is only given visions of one future narrative. We're inventing a second potential future for her right now - one where she doesn't have a child or watch her die. That alternative reality is hinted at in the film - it would, presumably, be a continuation of the relatively static (and stable) life she has at the start. I'm thinking of her house. The lake house. Big, beautiful, empty. The perfect stage for a child (and a husband, for that matter) to walk onto. "You have the power to withstand this sorrow. We all do, though we all claim not to. We say, “I couldn’t go on,” instead of saying we hope we won’t have to[...] More will be revealed. Your son hasn’t yet taught you everything he has to teach you. He taught you how to love like you’ve never loved before. He taught you how to suffer like you’ve never suffered before. Perhaps the next thing he has to teach you is acceptance." The lives of our loved ones are longer and more meaningful than the number of years they last. So if I'm Louise and I'm standing on this beautiful empty and stable stage, then yes, I make that choice. But what if I'm not? What if I don't (yet or ever) have the things - education, family, support - that grant the resilience you need to raise a child (let alone endure her death)? Or what if the thing I could build in my second narrative was as beautiful and meaningful as the child in my first - though only made possibly by her absence? What if the heptapods gave me visions of each? We're all holding a thousand futures in our head. Even stuck in the present, experiencing time sequentially, we're making Louise-type choices all the time. We don't need Heptapods to understand that life ends and that love exposes us to grief. Euripides wrote of Alcestis' passing: "She has merely unwrapped the gift of death her mother gave her." The best we can do is hope our choices are motivated by love, and not fear. But outside of Louise's narrative, it's impossible to simplify - as was my first instinct - and say that the choice motivated by love is the one to have the child. Which is my way of answering your question with "I just don't know". ... the emergence of a hieroglyphics of communication, which overlays the contemporary experience of cities, buildings, products, and media with a code of repeatable, reduced icons, compacted chunks of information which collapse a verbal message into a visual mark. The expanding domain of this hieroglyphic speech poses subtle problems for designers in the next millennium: How can we create cross-cultural communication without flattening difference beneath the homogenizing force of a single dialect? Perhaps these dubious achievements are what makes graphic design the black sheep of the design family. Graphic design lacks the spatial drama or presence or architecture and product design. Architectural criticism often contrasts the plenitude of architectural form with the one-dimensionality of “sign,” “communication,” “illustration,” “anecdote,” and “information”—the very modes of expression that graphic design traffics in. Umberto Eco's Ur-Fascism, an assessment of the defining characteristics of fascism, is well worth the long read. Having lived through the Mussolini regime, his perspective provides both a personal understanding and a political framework. To people who feel deprived of a clear social identity, Ur-Fascism says that their only privilege is the most common one, to be born in the same country. This is the origin of nationalism. Besides, the only ones who can provide an identity to the nation are its enemies. Thus at the root of the Ur-Fascist psychology there is the obsession with a plot, possibly an international one. The followers must feel besieged. The easiest way to solve the plot is the appeal to xenophobia. But the plot must also come from the inside: Jews are usually the best target because they have the advantage of being at the same time inside and outside. In the US, a prominent instance of the plot obsession is to be found in Pat Robertson’s The New World Order, but, as we have recently seen, there are many others. The followers must feel humiliated by the ostentatious wealth and force of their enemies. When I was a boy I was taught to think of Englishmen as the five-meal people. They ate more frequently than the poor but sober Italians. Jews are rich and help each other through a secret web of mutual assistance. However, the followers must be convinced that they can overwhelm the enemies. Thus, by a continuous shifting of rhetorical focus, the enemies are at the same time too strong and too weak. Fascist governments are condemned to lose wars because they are constitutionally incapable of objectively evaluating the force of the enemy. Ur-Fascism is based upon a selective populism, a qualitative populism, one might say. In a democracy, the citizens have individual rights, but the citizens in their entirety have a political impact only from a quantitative point of view—one follows the decisions of the majority. For Ur-Fascism, however, individuals as individuals have no rights, and the People is conceived as a quality, a monolithic entity expressing the Common Will. Since no large quantity of human beings can have a common will, the Leader pretends to be their interpreter. Having lost their power of delegation, citizens do not act; they are only called on to play the role of the People. Thus the People is only a theatrical fiction. To have a good instance of qualitative populism we no longer need the Piazza Venezia in Rome or the Nuremberg Stadium. There is in our future a TV or Internet populism, in which the emotional response of a selected group of citizens can be presented and accepted as the Voice of the People. An embrace of the Cult of Tradition. While easy to see Trump himself as a non-traditionalist due to his Bacchanalian and hedonistic impulses, there remain Traditonalists embedded deep within this movement. 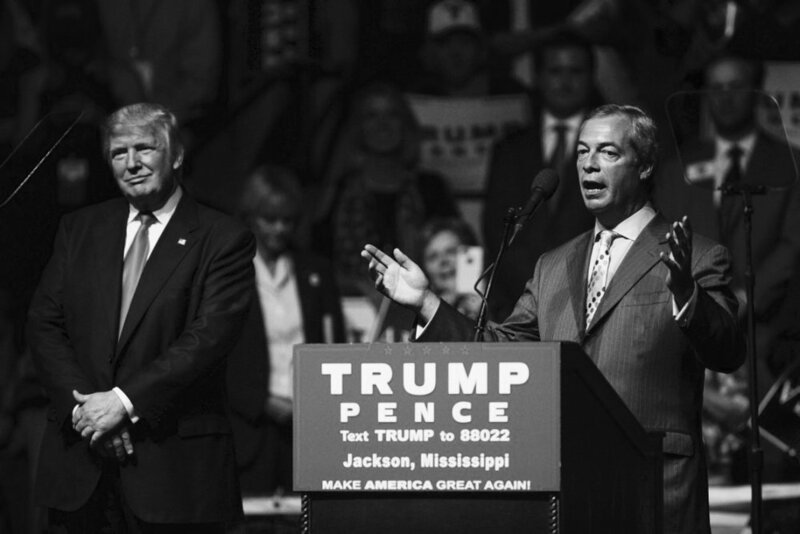 Nigel Farage, Marine Le Pen, Mike Pence; these are the Traditionalists. A form of Irrationalism with a particular bias towards Action. Trump's rejection of truth, his anti-intellectual streak, and the outlandishly postured anti-elitism of the movement as whole all draw from these deep wells. A deep and embedded Fear of Difference, outwardly and most obviously characterised as xenophobic leanings, but also by Pence's homophobic politics. Drawing from an economically Frustrated Middle Class. It's no coincidence that Europe's current flirtations and earlier embrace of fascistic politics follow large economic downturns. A defined and exclusionary Social Identity. This appears to present as nationalism currently, separate from white supremacy; to hear the leaders of this movement speak, they are avowed anti-racists (which, like, eyeroll) but they fundamentally believe Americans/English/French/Russian people are better than Iranian/Chinese/Mexican people. Trump's defining political character is America's Humiliation by the wealth and power of, in particular, China, the cunning and scheming of Isis and Iran, et cetera. Summarised as "We don't win anymore." Newspeak, to go straight back to Eco: "impoverished vocabulary, and an elementary syntax, in order to limit the instruments for complex and critical reasoning." Trump's syntax and vocabulary are awful, and so limited as to be childish and easy to mimic. "We're going to win bigly" springs to mind. To varying degrees, either the promotion or acceptance of Machismo. All the discussion of locker room talk, the misogynist policies of the Republic party, the outlandish hatred directed at women, in particular; these are all Machismo in one form or another. Combining these elements, and slight sprinkles of a few others as noted by Eco, gives us the core of the new fascism. But how to counter it? The last time the West encountered broad fascism, it lead to civil war and global conflict. We must prevent this outcome, but countering an ascendant ideology is no small task.